Blister, fever: A small sore situated on the face or in the mouth that causes pain, burning, or itching before bursting and crusting over. The favorite locations are on the lips, chin or cheeks and in the nostrils. Less frequent sites are the gums or roof of the mouth (the palate). 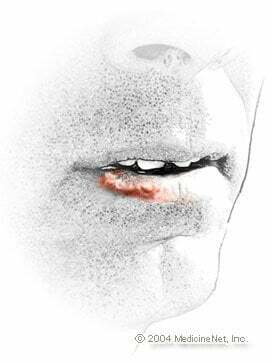 Fever blisters are caused by herpes simplex virus. It lies latent (dormant) in the body and is reawakened (reactivated) by factors such as stress, sunburn, or fever from a wide range of infectious diseases including colds. Recurrences are less common after age 35. Sunscreen (SPF 15 or more) on the lips helps to prevent recurrences of herpes from sunburn. There is no cure for fever blisters. Medications that can relieve some of the pain and discomfort include ointments that numb the blisters, antibiotics that control secondary bacterial infections, and ointments that soften the crests of the sores. Fever blisters are also called cold sores, labial herpes (herpes labialis, in Latin) and febrile herpes (herpes febrilis, in Latin).